Hooray! You have finally stepped into the world of business, ready to make a name for yourself in the future for all of humanity to remember! You already have an idea on what kind of business you would like to run, but the question remains, do you have a plan? How would you keep your business up and running until someone decides to take over? So, here are the steps that you can heed to ensure that everything falls into place. You may also business startup examples. Do the following tasks either before launch or during the early days of your startup. Be honest with yourself. Does your business sell products that are actually worth selling? With so much competition, how does yours stand out or make it so different from the rest? Businesses come and go, all the time. So make sure that your business earns and makes a profit at the same time. Otherwise, it is a business not worth keeping. You may also see blank checklists. Everything needs good planning, even a business. If the business is successful, how will you let it keep growing? If it is starting to fail, what will you do to make it work? If it is at the brink of bankruptcy, is it still worth keeping? Come up with a suitable business plan that will prepare you for the worst. You may also see task checklists. Having a business does not automatically mean you are able to support yourself. The road getting to a very stable business is very rocky, and never easy. Other than the business itself, there are other expenses that you have to consider: living expenses, utility bills, suppliers costing, workers wages. With so many factors to take in and consider, you need to find ways and means to make it work. Loan if you have to. Borrow money. You may also see registry checklists. Family comes first, always. No matter what, you have to make sure they got your back and are willing to help you out, especially when the going gets tough. Once you have their support along with your friends and loved ones, nothing can stop you! Choosing a business name is like naming your firstborn. So, make sure you go about it with your consultants or family or your significant half on what the business name should be. Aside from following the Keep It Short and Simple (K.I.S.S.) rule, make sure it should also be catchy and easy to recall. You may also see quality checklists. An AOL email address or a website with free hosting and a name like mysite.wordpress.com makes it seem like either (a) you are not running a real business or (b) you don’t plan to be around long. Incorporating your startup can protect your personal assets. Talk over structure (sole proprietorship, partnership, corporation) with your attorney and accountant. You may also see student checklists. An Employer Identification Number (EIN) helps you separate yourself from your business. You’ll need it if you plan to incorporate your business or open a business bank account. Plus, with it you can avoid giving out your social security number (an opening to identity theft). EIN numbers are free so apply online. You may also see registry checklists. Secure for a business license, otherwise your business would be considered illegal and you don’t want that on your mark. Get your website up and running as soon as possible. Today, it’s necessary for credibility. Even if your product is not yet built, you can start with company information. So make sure you hire some information technology experts (IT) experts who know how to make your website wow the crowds. You may also see vehicle checklists. Build up your reputation by setting up social media pages so that the people may be able to check for new products or promo updates that they may want to avail in the near future. But keep in mind that no two social media applications work the same way. Twitter is not Facebook, and neither are they Instagram. You may also see hr checklists. Depending on the type of business that you are going to set up, it may or may not need so much space. If you are setting up a restaurant, then you can rent retail space. But for big or small corporations, you can always rent office space. Keep in mind that rental fees are high for either one. You may also see wedding checklists. Business cards help build up your reputation as a person. You will need to do a lot of sales talk and networking in order to get people to come and check your place out. Print out as many as you can and hand them out as fast as you can. 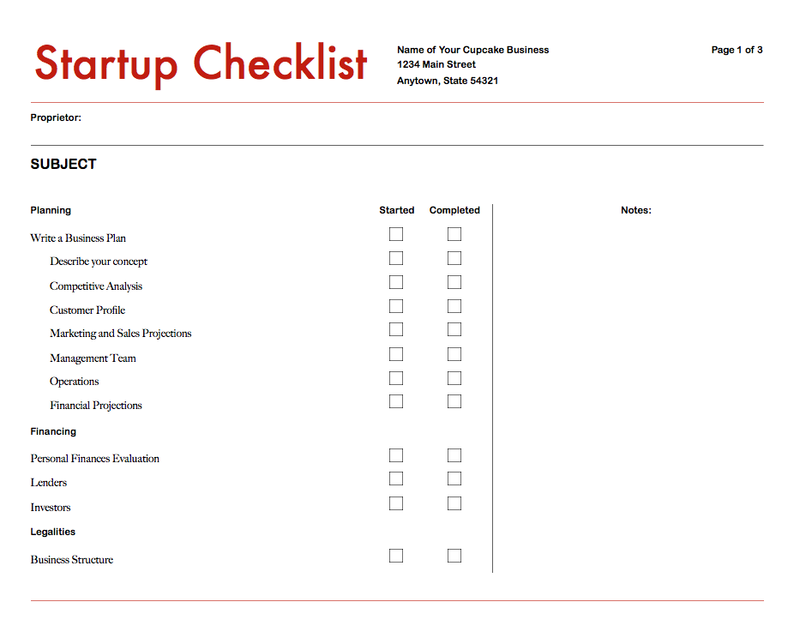 You may also see start up checklists. Just like a business email is a total separate entity from a personal email, it is important to separate your personal bank account from the business. Though it is tiring to manage two bank accounts, but it will be worth it in the long run. You may also see team meeting checklists. Or simply put, get accountants to help do the workload for you. That is their main job, after all. Once you have everything settled out, start giving out tasks to the co-founders of the business to help carry your cross. If you are the sole proprietor, then, train capable and honest-to-goodness managers. You may also see cleaning checklists. As the founder, you are going to be extremely busy trying to keep up with all the tasks at hand for you. So, you would probably want things to be done easier for you. If there is a way to avoid all that paperwork, take it. You may also see audit checklists. Get a consultant. Or attend some business seminars and talks to help you understand what you need to do next in the following days as a businessman. People who have been in the business game longer than you have more experience and knowledge than you realize. And trust me, they do not want you to make the same mistakes they did, to make your life a bit easier. You may also see resignation checklists. You will never know what is going to happen to you, or the business, or even the employees. All the more reason to get an insurance plan so that you may be reimbursed in case something happens. But always hope for the best. Set up classified ads. Post in Facebook, Twitter or any job-offer websites the Internet might have. Hire employees to help you do the work for you, for the business to eventually grow into a success. 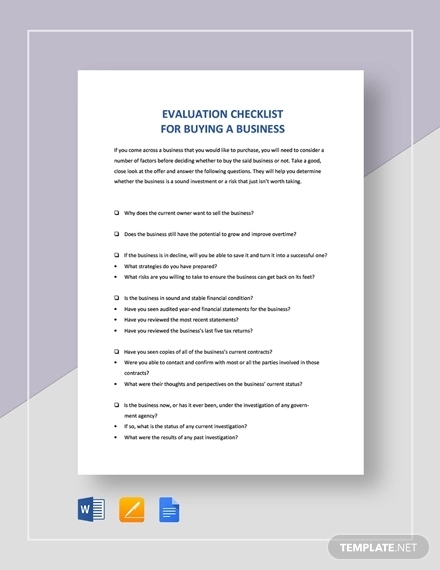 You may also see marketing checklists. Cheaper is not always better. If you are running a restaurant, you would want the freshest and most superb quality of meat products or any products for that matter. You do not want to offer rip-offs, don’t you? The best thing to do is consult an attorney early about the need for patents, especially. Get the advice early. Then you may be able to defer filing for a while, depending on the nature of your business. You may also see construction checklists. Reach out to former co-workers and colleagues, as well as friends and family. Don’t pressure them to buy your products or services. Instead, tap into them for introductions and help with other things on this startup checklist. You may also see rental checklists. Partnerships can wait. Your business comes first. Like a seed, allow it first to grow. As the plant gets bigger, so will the roots. Once your business is stable enough to allow for a bit of risks, invest in a partnership for opportunities. They say if it ain’t broke, don’t fix it. Well, they’re wrong. Especially in today’s generation, you need a cool and convincing enough pitch to bring in not only customers, but also potential investors and partners. 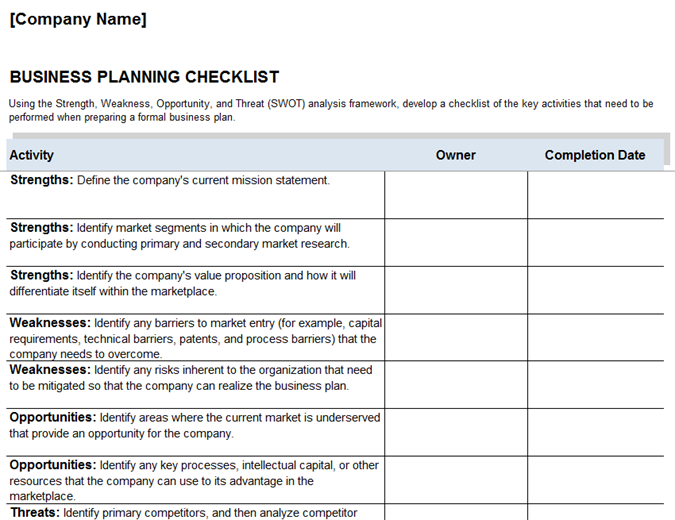 You may also see performance management checklists. The longer you stay in the business, the longer you know more about your customers and what they have to say about your product. “Know your opponent and you will never lose. Know yourself and you will always win.” This quote from Sun Tzu, the author of The Art of War sums up this step. You may also see cleaning checklists. At the start of the business venture, it will always be the owner who handles the sales talk to promote the business. But as the business continues to grow there are more important things to cater. So hire a professional sales and marketing team to handle the promotion works. It’s all to easy easy to work “in” your business rather than “on” it. As Michael Gerber tells us in The E-Myth, we need to be working “on” our businesses if we want them to grow and flourish. A mentor who has succeeded in your industry can provide you with priceless advice and serve as a sounding board. You may also see new apartment checklists. There might be more steps to take than just this, but always remember that a business without risks will never grow. 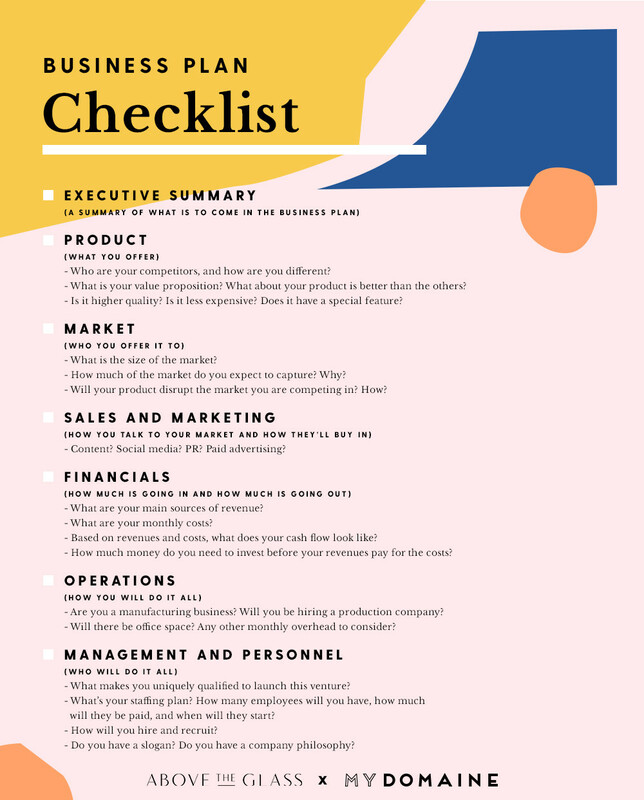 There is no sure fire way to set up your own business with a snap of a finger, but we have made it easier for you with the help of this comprehensive guide. You may also see grocery checklists.